Warning: This blog is pretty boring, but it's my day, and it was a pretty good one, so I'm blogging about it. Today has been a pretty cool day. We got a fair ammount of sleep last night, though Miles did request a feeding at 2:30 AM, but considering he went right back to sleep once he was done, I really can't complain. I was able to get a bath in before noon this morning and do my hair and make up, which to me, is considered a luxury. Then I took Miles with me to go pick up some yummy lunch from Spoons Bistro and take it to go visit my friend Heather and her 3 children at her home. After visiting with Heather, we were off to a doctor's appt. for me. I had gotten a nasty splinter stepping in some mulch this past Sunday and we couldn't get it out. Over the last day or so the tiny particle on my heel has turned into a major pain and seemed to be infected. So even though I was pretty daunted at the thought of taking Miles to the doctor with me, I figured walking around with a splinter in my foot would be even worse. So I took a big breath and brought him along. He was so good and I got to practise even more of my nursing and diaper changing in public skills while waiting the better part of an hour to see the doc. The fun thing about taking Miles out is how other people react to babies. People come up and ask all sorts of questions and look at him like he is the only baby they have ever seen in their life. I mean, I know my own mother looks at Miles like that and so do John and I, but I wasn't expecting other people to be so giddy. It's a really fun thing to encounter and pretty unexpected. We are home now and Miles is still napping in the carseat from his long afternoon away from home. It's a little after 5, so John should be emerging from his office soon for our evening walk with the pugs. Today was a great day and even though it was filled with pretty mundane errands like going to the doctor or to the pharmacy, with Miles along, it seems more like a successful adventure since I got him out of the house and back with him smiling along the way. 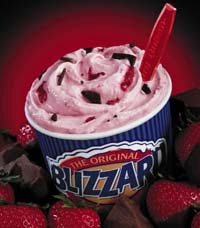 Yummm...I want a Blizzard now. Great idea! Take care!